I’m feeling a bit better today, maybe getting used to a lot less caffeine and a lot more carbs and fat than usual. Breakfast and lunch are the same as usual with the addition of a bowl of soup made from chicken stock, some water, a few lentils, smidgeon of chopped carrots, onion and potato. Soup turns out be a good addition to a peanut butter sandwich with a few slices off the diminishing apple. 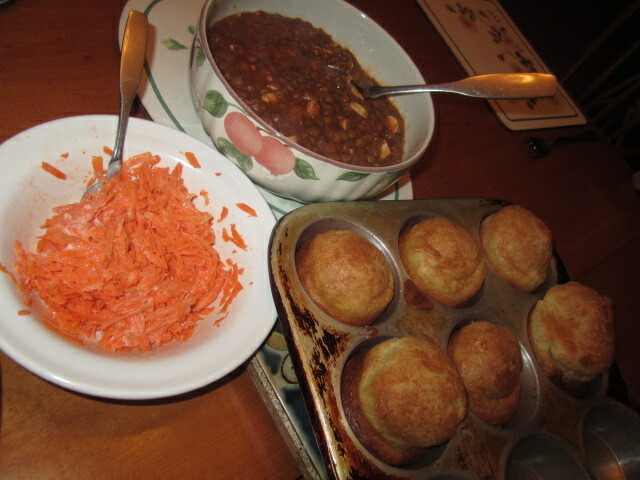 Dinner is lentil stew, with a very few bits of chicken to give a semblance of meat, accompanied by popovers made with chicken fat, and shredded carrot salad. We like lentils, and the addition of a spoonful of tomato paste gives the stew some added body and flavour, in the absence of herbs and spices. The popovers give the illusion of hearty fare, but truth to tell, they are mostly hollow. Once again, we have the illusion of more food than there actually is. But they add crunch, taste good, and somehow evoke the memory of roast chicken. I have received a complaint about carrot salad (cole slaw with no cole family in it), so carrots will have to come to the table in a different format in future.